The first lady's visit comes after President Trump signed an executive order halting the practice of separating families. 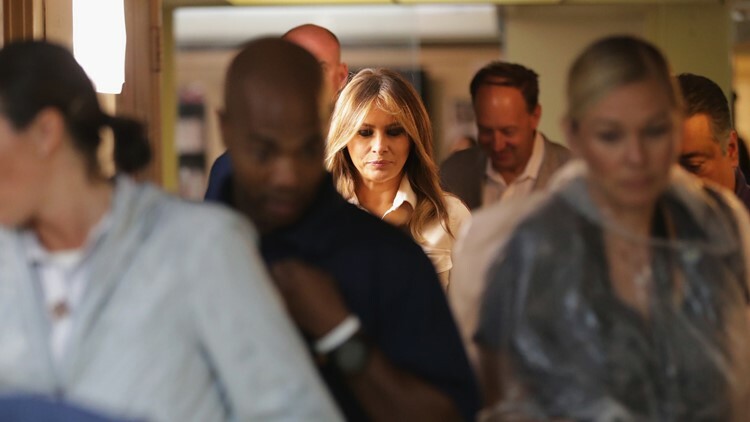 McAllen, Texas — Melania Trump made an unannounced visit to a Texas facility Thursday to get a first-hand look at some of the migrant children sent there by the U.S. government after their families entered the country illegally. The first lady's stop at Upbring New Hope Children's Center in McAllen came the morning after President Donald Trump signed an executive order halting the practice of separating these families. She may also visit a second facility later in the day where children housed in cages were seen by The Associated Press last week. Trump had come under pressure to stop the practice, including from GOP allies and the first lady herself, following a public outcry sparked by widespread images of children held in fence-like structures. The trip was intended to lend support to those children who remain separated from their parents, said Stephanie Grisham, the first lady's spokeswoman. "She wanted to see everything for herself," Grisham said. The president had insisted incorrectly that his administration had no choice but to separate families apprehended at the border because children cannot go to jail with adults who are being criminally prosecuted for crossing the border illegally. Trump had said only Congress could fix the problem and he specifically pointed a finger at Democrats. He reversed course Wednesday by signing the order ending separations and keeping families together when they are in custody, at least for the next few weeks. The administration's "zero-tolerance" policy of criminally prosecuting illegal border-crossers, which has led to the removal of some 2,300 children from their parents since May, remains. Accompanied by Health and Human Services Secretary Alex Azar, Mrs. Trump met with the executive director of the facility and other staff in a makeshift conference room where she was told the staff treated the 58 children housed there as if they were their own. The first lady asked that the children be reunited with their families "as quickly as possible." The trip came together within the past 48 hours, Grisham said. "She told her staff she wanted to go and we made that happen," she said. Trump, speaking at a Cabinet meeting, said that his wife was "down at the border,'" and Grisham said that the first lady had the full backing of her husband. "She told him 'I am headed down to Texas' and he was supportive." Hours before Trump used his executive order to halt family separations, a White House official let it be known that Mrs. Trump had been voicing her opinion to the president for some time, including that he needed to help families stay together. The official refused to be identified discussing Trump's private conversations with his wife. Trump acknowledged Wednesday that the mother of his 12-year-old son, Barron, had been prodding him. "My wife feels very strongly about it," he told reporters after he signed the order. The pair of statements from the first lady amounted to an unusual public intervention by Mrs. Trump into a policy debate. Her four former living predecessors, seemingly encouraged after Laura Bush authored a scathing opinion piece, followed with sharper commentary of their own condemning the family separations as shameful. The last-minute trip to Texas marks the first public action by Mrs. Trump since she announced in May an initiative named "Be Best" to focus on the overall well-being of children and help teach them kindness. She had been expected to travel to promote the campaign but was sidelined a week after the announcement following surgery to treat a benign kidney condition.